TEN long years after an all-Aboriginal football team crushed a combined Richmond/Mildura side in country Victoria, an act of proud defiance would lead to a second such All-Star match and moves to bring Australian football out of the dark ages and into a new era of respect for the modern game's Aboriginal stars. It is altogether ironic, too, that this would come about because of overt racism in a public arena during the International Year of Indigenous People. What started out as a regular home-and-away match between AFL sides Collingwood and St Kilda at the Magpies' base Victoria Park, ended in a turning point for the game. St Kilda team-mates, Nyoongar champion Nicky Winmar and Kimberley countryman Gilbert McAdam, were in fine touch for their team in their 1993 Round 3 clash with home side Collingwood. The pair played leading roles in steering the Saints to a rare away victory, their first at the ground since 1976. But they endured terrible racist taunts that day from certain sections of the Magpies crowd and, sadly, from some Collingwood players. It was post-siren, with sweet victory his, that Winmar turned to the crowd and lifted his jumper and pointed to his skin. That one act, captured by The Age photographer, Wayne Ludby, emboldened the Aboriginal cause in football and led a sleeping AFL to move to stamp out the scourge of racism in a more formal manner. It was also from this moment in time that Aboriginal AFL footballers would begin to publicly assert themselves and their Aboriginal pride against racism on and off the field of play. Subsequent moves by the players and the AFL itself led to a greater awareness of the game's Aboriginal roots, its heritage, and a reconciliation of sorts towards its Indigenous players and fan base. The upshot of Winmar's courageous stance was that, as a gesture of reconciliation within the football fraternity, the AFL organised a football match between an all-Aboriginal side -- the All-Stars -- made up of AFL-level footballers, and Collingwood. THE game was scheduled to be played in the early pre-season of 1994 in cosmopolitan Darwin, capital of the Northern Territory, one of Australia's most culturally diverse cities. A panel of selectors and coaching staff for the All-Stars was appointed: Indigenous football legends Bill Dempsey, Syd Jackson, Barry Cable and Maurice Rioli were entrusted to assemble an AFL-standard all-Aboriginal football team to take on the might of Collingwood, AFL premiers two seasons earlier and high finalists thereafter. 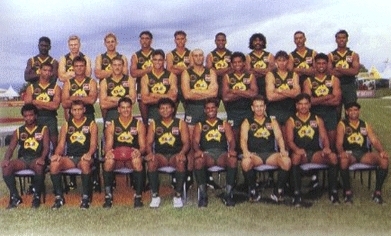 Their selections complete, the 1994 side was comprised mainly of current AFL players with a smattering of State- and Territory-based players. The squad comprised 11 players from AFL clubs, six from State leagues, and nine from the Northern Territory Football League (NTFL). Ironically, Winmar was denied permission by the Saints to play with his brothers. Other star players of the time, Essendon duo Michael Long and Gavin Wanganeen were both injured and unavailable for selection. The Aboriginal All-Stars had a point to prove. As the side ran out on Darwin's Marrara Oval to the roars of approval from the 11,000-strong crowd, it was with a sense of purpose. The team looked solid. It had a decent all-round spread of talent with its key positions filled with proven soldiers. Captained by the Brisbane Bears' Michael McLean its solid defence was led by burly St Kilda/Brisbane defender Russell Jeffrey at full-back, its pacy centreline had 20-year-old Fabian Francis across the middle, and it had robust forwards in West Coast's Troy Ugle and agile NTFL forward Dennis Dunn. The contests early were hard. Fierce tackling on the part of the All-Stars showed that they were here to play. Collingwood, coached by the master Leigh Matthews, were equally committed to the contest. There was no room for the faint-hearted as the two teams engaged in a tense arm wrestle in the early stages of the match. Once the game settled into a rythymn, however, the All-Stars' superior foot-speed saw it rise to every challenge. By the final siren, the composite side were in front by 20 points, defeating the gallant Magpies 13.10 (88) to 10.8 (68). The game itself was a good one and it served its purpose: providing Aboriginal Australia with something tangible in response to the incident at Vic Park, and giving the Collingwood Football Club a chance to 'atone'. But of itself, the game certainly did not solve entirely the issues brought about a year earlier at Victoria Park. But it did show the football world that the AFL had at least confronted the issue of racism and were making tentative steps in the right direction.